If you’ve visited the cat adoption building recently, you may have noticed some big changes over the last few months. Over the summer, both colony rooms received upgrades to make them more comfortable for our feline residents. 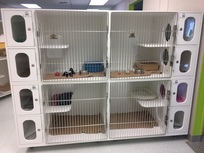 Last month we received new, more spacious cat condos thanks to a $75,000 grant from the Petco Foundation. You can read about the new cat condos on our blog. Also, check out this new video about how to do a hard clean on the new condos. In addition to these upgrades, RASKC cats have several other exciting new things coming their way! Foster kittens will now be located in a new space in the front lobby, and the back room that used to house these kittens will soon be turned in a meet-and-greet room. This will give adopters an opportunity to meet with cats in a more open and inviting space. RASKC is also developing a new cat enrichment program to improve the quality of life for our cats until they get adopted. Our goal with each of these changes is to enrich the lives of the cats while they are with us, and get them into their forever homes sooner! Thanks so much to all of our cat volunteers for your patience as the cat building has been going through these transitions! In addition to providing a range of adoptable kitties to the Meowtropolitan Cat Café in Seattle, RASKC will soon be providing feline leukemia-positive (FeLV+) adoptable cats to the NEKO Cat Café that will be opening soon in the Capitol Hill neighborhood in Seattle. FeLV+ cats can be fantastic pets and live very happy lives. See this FAQ fact sheet from Best Friends Animal Society. NEKO Cat Café is bringing the cat cafe culture of Japan to Puget Sound with a unique, fun and elegant cafe featuring alcoholic and non-alcoholic beverages, small bites, and cats. NEKO Cat Cafe will be home to about 10 adoptable cats of all shapes and sizes. The venue is envisioned to be a sanctuary for cats, adults, and families with children. Pet licensing says, "Protect your pumpkin!" 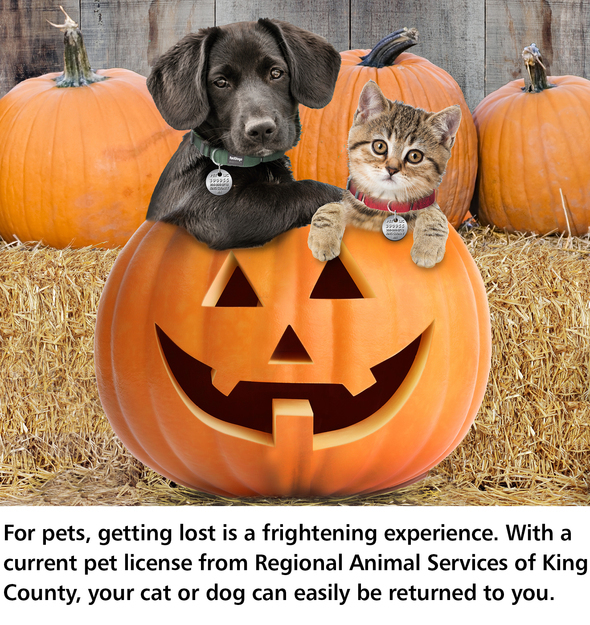 For information on annual pet licenses for those who reside in unincorporated King County or the 25 cities that contract with RASKC, go here or call our Pet Information Line, 206-296-7387 (PETS). Marie and her adult daughter Dawn are among RASKC’s most dedicated and longest-serving volunteers. They started volunteering together as kitty cuddlers in 2006. They have worked in many RASKC roles since that time. Marie now works regular cat-care shifts at Reber Ranch, plus she and Dawn staff RASKC’s booth at community events. Every week Dawn selects, photographs, and writes descriptions for RASKC’s Pet of the Week that are featured in several suburban newspapers and websites and also on the RASKC website and blog. She also updates RASKC photographs on Petfinder and has served as an instructor. 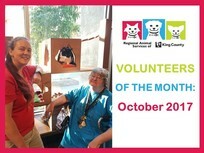 Dawn and Marie often provide transportation to RASKC cats from Kent to the Meowtropolitan Café in Seattle. Marie has also contributed several hundred hours as a member of RASKC’s Volunteer Banquet Planning Committee for many years.Thank you, Marie and Dawn! Please help welcome new RASKC employees, including Animal Care Technicians Rebecca Smokoska and Ashley Fenton. Rebecca has worked as an Animal Care Specialist at The NOAH Center, and she had interned at Sarvey Wildlife in Arlington. Ashley had previously worked at RASKC in 2010, and we're so happy that she has returned. She is also the mom of two children. We are also very happy that Molly Brooks has been hired as a Customer Service Specialist III in our pet licensing section downtown. Welcome, Rebecca, Ashley, and Molly! Pet Licensing Marketing and Sales Coordinator Sandy Jones has been working for RASKC/King County Animal Care and Control for 24 years. Tell us about yourself. I was raised in Lewiston, Idaho with my three siblings. I attended Boise State University and Lewis-Clark State College, receiving an AA degree in Business. After Tom and I married in 1982, we moved to Kent. I then earned a degree in Travel and Airlines. I first worked in a marketing and sales position with the airport Sheraton. In 1986 we moved back to Idaho. While there I worked for the City of Lewiston as a Marketing and Sales Coordinator for the publicly owned airport. In 1990 we moved to Kirkland, where we continue to live. In 1994 Tom and I were blessed with our child Ellie. Why did you decide to work for animals? In 1993 I was hired by King County as a canvasser to license pets at local grocery stores. King County educated me that the difference from a pet being alive or euthanized was a pet license [Editor: Whether or not a pet is licensed is no longer a factor in RASKC's euthansia decisions]. I took this part-time job very seriously and I put my sales background to use educating citizens on the importance of a license. Almost 24 years later and I’m still working at educating people on the importance of a pet license. What is the best part of your job? Bar none it is seeing the changes that have taken place at RASKC and King County for the protection of animals. It is great to work for an organization that has such a high save rate and places a high value on a segment of our population that cannot speak for themselves; it wasn’t always this way. I also love working with people and having each day be different due to the numerous groups I work with – citizens, employees, partners and, of course, our great volunteers. What do you do when you are not at work? I like spending quality time with family and friends. My husband and I are huge WSU Cougar fans. GO COUGS! Please share a story about an experience with a great volunteer. I meet with the volunteers who have signed up to represent RASKC at events. I educate these volunteers on the importance of a pet license to RASKC, the communities we serve, and, of course, the pets. Each time I meet with a new event volunteer I ask them to tell me their story of how they got involved with RASKC and what they do for RASKC as a volunteer. Each time I’m truly amazed by each of these volunteer’s stories and the dedication for success they have for our program. I truly believe RASKC is a better place due to their support and commitment to our program, thank you! October is national "Adopt a Shelter Dog" month, so we present Pretty Boy (A541028) and I am available for adoption at the RASKC Pet Adoption Center in Kent. 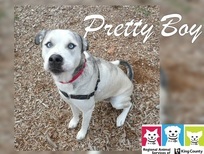 I am a 3 year-old neutered male Akita mix. I am a spirited dog with a fun-loving personality! I am still working on my manners, so I would do best with a family who is willing to work with me and help me become the best dog I can be! I am a very smart dog. I have shown my caregivers that I already know how to "sit", "stay" and "shake". I am full of energy and I love to play/ I do best when I have lots of exercise and something to keep my mind busy. My caregivers have observed that I might not get along with other dogs. I may do best as the only dog in my new home, or need to meet other dogs in the home first. Pizza Party at RASKC/ Kirkland: About 15 volunteers, some pictured here, gathered for team socializing at our venue inside of Kirkland Petco last month. Thanks to Nickie Ford, Animal Services Coordinator, and all who attended! Free tickets to Jackson Galaxy: Animal Planet's Jackson Galaxy will be in Seattle on Friday, November 17, at 7pm at the University Temple United Methodist Church to promote his new book Total Cat Mojo. Volunteers at local animal shelters and their guests may receive a free ticket if you email your request to heather.levin@ubookstore.com. Please identify yourself as a RASKC volunteer and wear your t-shirt to the event. Paid Animal Control Officer opening in Auburn. The City of Auburn is hiring an Animal Control Officer, $55,578- $66,223 annually. Employee Giving: If you participate in an employee giving campaign at your workplace, please consider making a donation to RASKC. 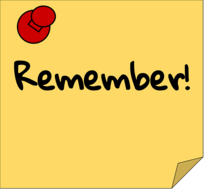 If we are not on the list of organizational choices, please let us know so we can apply to be on the list for next year. Training video- How to "hard clean" our new cat condos: Check out the new video, featuring intern Unite Titalii, on how to thoroughly clean a cat condo when a cat no longer resides there. When you've completed the hard cleans on your shift, remember to place the brush and mini-dustpan with the other soiled items, like the water bowl and litterbox, to be washed and sanitized in the other building.